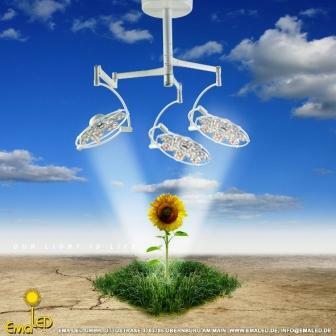 EMALED 560/560/560 we have upgraded our family of surgical lights. 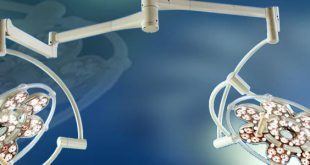 With a diameter of the light head of only 61 cm and an illumination intensity of 160.000Lux total 480.000Lux we are now able to offer you one of the smallest and brightest surgical lights in this category. The light diodes produce light in a near-to-sunlight spectrum of 4.200 K and a color rendering index of 92 without warming the operative field with the infrared or ultraviolet light. The illumination intensity, which is adjustable from 10% to 100%, and the operative field size are being regulated by control panel at the light head or optionally by cable-free remote control. The standard, completely gimbaled suspension system and the easy moving of the light head enable comfortable working. Surgical light EMALED 560 has an optional, uninterrupted power supply that automatically sustains power of the accumulators charged up for about 4 hours without being connected to an electrical outlet. The newest LED technology, the long life cycle of the diodes of at least 40.000 hours, the low energy consumption of the surgical light (80 W) and the small maintenance effort enable economical use of EMALED 560.